When I first heard about Vicious, it sounded like everything I wanted in a show, but didn’t realize I wanted until the final product actually existed. ITV’s new comedy stars Ian McKellen and Derek Jacobi as Freddie and Stuart, a couple of nearly 50 years. It’s 20 minutes of good fun with a charismatic cast. What more could you want? Other than McKellen and Jacobi (who alone would be enough to get me to watch), Vicious features Frances de la Tour and Iwan Rheon. De la Tour is Violet, Freddie and Stuart’s flirtatious friend and Rheon is Ash, their young new neighbor. Both Violet and Freddie relentlessly hit on Ash, which begs the question: why does he keep coming back? Hopefully the show will quickly create a bond between him and the rest of the cast, otherwise they’ll have to keep inventing believable reasons why Ash would continually return for awkward encounters with his much older neighbors. It’s not the sharpest comedy ever, but it’s still very funny. There is a lot of witty banter. I started to make a list of my favorite quotes, with the aim of creating a list of highlights, but halfway through, there were so many that I gave up. McKellen and Jacobi play off each other well, giving as good as they get. Jacobi is hypersensitive, and prone to hysterics, which McKellen counters with a deep, overly-theatrical voice. Sometimes the bickering went a little far, and I was left wondering how they had lasted for over 40 years as a couple. There were several tender moments between the two that hopefully will be expanded upon. It’s the first episode- it doesn’t have to be perfect. For now, there’s a foundation there that can be built from. 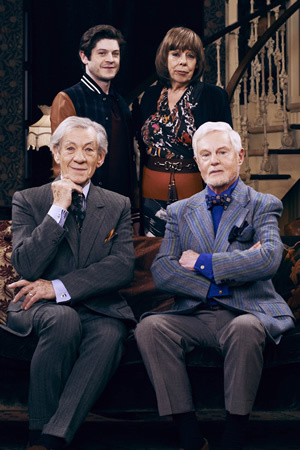 Vicious isn’t groundbreaking television, but it’s an entertaining half hour of witty dialogue, delivered by a charismatic, engaging cast. It’s a perfect pick-me-up after a long day.